This is Raili, a happy customer in Finland, with her Lynx Deluxe messenger bag. What wonderful photographs, taken by her son, a professional photographer. Thanks so much for sharing them! 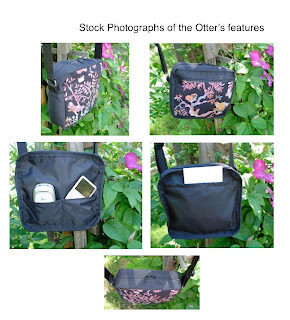 This was a custom order Otter, my small shoulder bag with lots of organizing pockets, and adjustable shoulder strap. The customer was very pleased and I am delighted to share her comments with you. "I'm so excited!!! the shoulder bag was delivered today and I love it. It's the perfect size for me, I love the zipper pocket on the outside, nice and secure and I love the zipper closure, great pockets inside for staying organized. The strap length is perfect for me to sling it across my body. Delivery was super fast - packaged well and very accommodating shop. One of my best buying experiences. Thank you so much!!! Judy 4/12"